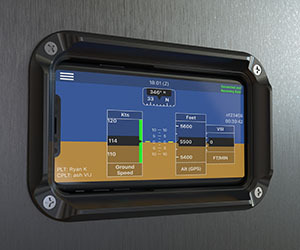 Guardian Avionics, announces the addition of new flush panel mount models for the Apple iPhone X and Apple iPad Pro 10.5-inch models to the smartPanel Mount line of mounting solutions to install an iPad or iPhone within the instrument panel on any FAA Certified Part 23 or experimental aircraft. The smartPanel line already includes mounts for the Apple iPad Pro (12.9”), the Apple iPad 9.7-inch models, iPad Mini, and the Apple iPhone 6/7/8 and 6+/7+/8+. With the addition of the two new mounts to the line, Guardian Avionics has a flush mounting solution for every current iPad and iPhone product on the market.